DES MOINES – The Iowa Barnstormers have signed defensive back Tevin Madison to the 2019 roster, Head Coach Dixie Wooten announced today. 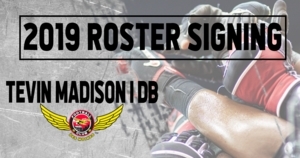 Madison (5’10, 180, Texas Tech) joins the Iowa Barnstormers for his first season in the Indoor Football League (IFL). Collegiately, Madison began his career at Texas Tech in 2014 appearing in over 20 games during his three years with the Red Raiders. Madison chose to transfer during the 2016 season and found a new home at the University of West Alabama. In 2017, Madison appeared in 13 games with the Tigers where he collected 66 total tackles (43 solo, 23 assisted), 22 pass breakups, and five interceptions. Madison is the sixth DB to enter the Iowa Barnstormers 2019 Training Camp.